In celebration of World Food Day 2013, today we present to you an incredible project: United Noshes. When we first came across United Noshes, we immediately fell in love. The concept of United Noshes is the epitome of being a TCK. It’s where Jesse Friedman and Laura Hadden, an adventurous husband-and-wife team, host dinners from their home in Brooklyn, New York that explore cuisines from around the world. More specifically, the cuisines from the member states of the United Nations. Genius. United Noshes’s mission is to cook one feast from every United Nations member and permanent observer in alphabetical order. To date, they’ve completed just under 70 meals. For each meal, they aim to create as authentic an experience as possible, carefully researching recipes, and investing ample time to ensure that they prepare these meals as traditionally as possible. Their hope is to expose the community to various cuisines they might not otherwise know about. The best part? This is all done while raising money for the World Food Program. Thanks to word of mouth and some press, United Noshes has hosted a diverse group of diners from all corners of the world, including: someone from Ghana who brought and shared local ingredients to help with the meal; someone from Equatorial Guinea whose father was an ambassador; someone who was half Danish and half Finnish, and attended both the meals from Denmark and Finland; someone from Albania who works at the United Nations, and was able to share the recent history of the country. Denizen had the opportunity to chat with one of their founders, Jesse Friedman, the Chef and Shopper of the operation. We often get stuck in the same habits, even here in New York. We don’t spend much time in people’s homes getting to know each other, and it can be really awkward to break out of a social circle and expand. United Noshes is about bringing the community together. 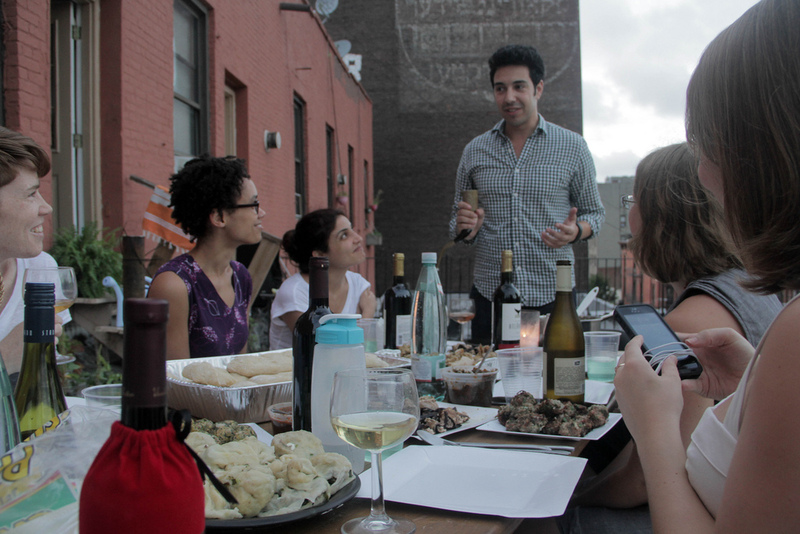 We found an opportunity to invite both strangers and friends into our home to share a meal. Once you settle on a member state’s cuisine, what is the process to bring this meal to life? We find recipes online from various sources, whether it’s from a blog or a collection of recipes. I research the week before a meal, and really try to find recipes from the country itself or from someone with a strong connection to that country. I have a pretty good spidey sense on which recipes are real and which ones may have been adapted. Once the menu is finalized, we send out the invitations, and seat attendees based on the venue. Where do you source the food from? I try to get produce from the farmer’s market. I do all the shopping myself. In every major metropolitan area, you can at least find one ethnic market from every major part of the world. I have a bike and I’m not afraid to use it! What has been your favorite part of this experiment? On a personal level, this has been a wonderful hobby. It’s a great blend of structure and creativity: researching across different languages, and solving the fun cross-cultural challenges. That’s like getting a Masters in food history! It’s also been incredible to see how the same ingredients are used in different way throughout the cuisines. For example, learning about the history of the chili pepper, potato, and black pepper and how those ingredients traveled through different countries. Meal 64: Georgia. Photo courtesy of Laura Hadden. Which cuisines have you enjoyed discovering? Georgia. The food is incredible! They use a lot of fresh herbs, and there are many wonderful ways to cook chicken. There’s a delicious cheesy bread, which is like a more indulgent form of pizza. A friend has lived in Georgia so we were able to host the feast Georgian style. The entire experience was very special. It was a full immersion, tons of storytelling and even Stalin-themed wine. Also, Comoros. The cuisine is fascinating. There are a lot of Arab, African, Indian and French influences. We made a lobster with vanilla sauce; one of the most memorable dishes we’ve made. Which country would you like to visit to try the cuisines? We’re actually going to Argentina soon, driven in large part by the amazing meal we had! Meat, wine, chimichurri sauce … there is just no way around it, you’re going to have a great meal when it’s Argentinian! We probably wouldn’t have considered visiting Comoros before this, but if its culture is as fascinating as its food, then you know it will be a very interesting place to visit. What was the most surprising thing you learned about this experience? Raising money for the World Food Programme gives it a real sense of purpose. We’re grateful that Google has agreed to match donations. We’ve raised enough money for 60,000 meals. Guinea-Bissau. Most of our meals are done in our apartment in New York. We’ve also held gatherings in Tacoma, Portland, few in Bay Area, Boston and DC, with an approximate attendance of 10 people at each meal. How can people help/contribute to this program if they are not able to attend? If you know a lot about a given country anywhere from H to Z, please send us an email. Please also donate to the World Food Program to help with the world’s largest solvable problem. Top image: Meal 41: Côte d’Ivoire. Photo courtesy of Laura Hadden. Betty is a Denizen contributor. She has lived in Taipei, Bangkok, "the OC", moved to Chicago a few years ago, as a result of a quarter-life crisis. She just recently hit her second major quarter-life crisis, which moved her to San Francisco. She graduated from University of California, Irvine in Political Science and International Studies. When she's not working, she is planning her next big adventure (or her next meal, whichever comes first).